Alberta is filled with former Saskatchewan residents who’ve headed west in search of opportunities, so Pat Simmons fits right in as the first-year vice-skip for Kevin Koe’s curling team. Koe, who won the 2010 Tim Hortons Brier and world men’s championship with third Blake MacDonald, second Carter Rycroft and lead Nolan Thiessen, had to find a new player for the run up to the 2013 Tim Hortons Roar of the Rings Canadian Curling Trials in Winnipeg when MacDonald announced in the off-season that he was stepping aside. Koe and Co. didn’t have to look for long; Simmons is one of the most respected players in the game with a powerful resume of his own playing out of Saskatchewan, and he jumped at the opportunity to play with the Alberta powerhouse. 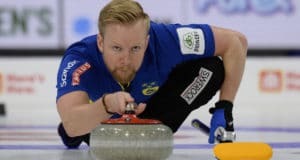 The Moose Jaw chiropractor was no stranger to big-time curling before he hooked up with Koe; he skipped four straight Saskatchewan men’s champions, from 2005 through 2008, and also played in the 2011 Brier, throwing last rocks for Steve Laycock. His closest call came in 2008 at Winnipeg, where he finished second in the round-robin with a 9-2 record and had eventual champ Kevin Martin on the ropes in the Page one-two game before a 10th-end pick cost him the game. He would then lose to Glenn Howard in an extra end in the semifinal. Prior to his men’s success, Simmons was a three-time participant in the Canadian Junior Men’s Curling Championship, in 1992 at Vernon, B.C., in 1994 at Truro, N.S., and 1995 at Regina — making the semifinal in his last appearance while playing third for Neil Cursons. 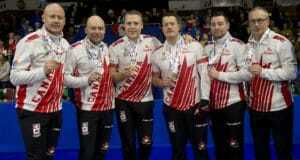 Simmons also qualified for the 2009 Tim Hortons Roar of the Rings Canadian Curling Trials in Edmonton, finishing seventh with a 2-5 record.